The trachea extends distally 10-12 cm and divides into the right and left mainstem bronchi (primary) at the level of the T5 vertebra (see image below). The right mainstem bronchus originates higher than the left mainstem bronchus; it is also shorter, wider, and more vertical. It measures about 2.5 cm and appears as a direct continuation of the trachea. The left mainstem bronchus is about 5 cm in length. Mainstem bronchi divide into the lobar bronchi (secondary) and subsequently into the segmental (tertiary) bronchi (see the image below). Arteries, veins, and lymphatics also enter the lungs at the hilum along with the bronchi. A bronchopulmonary segment is a portion of lung that is supplied by a segmental bronchus and its adjacent blood vessels. As bronchi divide into smaller airways, the respiratory epithelium undergoes histological changes and gives rise to terminal bronchioles. The 17th to 19th generations of bronchioles constitute the transitional zone. These bronchioles enter pyramid-shaped pulmonary lobules separated from one another by a thin septum, with the apex directed toward the hilum, comprising 5-7 terminal bronchioles. The last 2-3 generations of bronchioles have some alveoli in their walls and make up the respiratory zone. The area of the lung that is distal to a terminal bronchiole is termed the acinus. 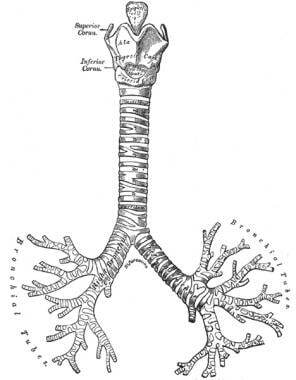 [2, 4] The final division is called the respiratory bronchiole, which further branches into multiple alveolar ducts. Alveoli, the functional units of the respiratory system, start appearing at the level of the respiratory bronchioles. The bronchial wall is made up of mucosa, lamina propria, smooth muscle, and submucosa with interspersed cartilage. The initial generations of the bronchi are similar to each other in their histologic structure, except for the amount of hyaline cartilage. In the trachea, the cartilage encircles the lumen, but in subsequent divisions of bronchi, it is replaced by diminishing quantities of cartilage plates. The bronchial submucosa contains mixed compound tubuloacinar glands, composed largely of mucin and serous-secreting cells. These cells secrete water and electrolytes into the bronchial lumen. Mucin is a complex glycoprotein that is responsible for trapping particulate material (ie, cells and debris) in the bronchi. The presence of mucin, water, and electrolytes contributes to the solubility of bronchial secretions. The cilia present in the luminal aspect of epithelial cells are in charge of the rhythmic upward movement of bronchial secretions from within the lung to the pharynx. The respiratory epithelial cells are composed of basal bodies, also called terminal bars, which form a dark band just beneath the cilia and are modified centrioles. The airway epithelial cells have apical junctions between them, comprising the zonula occludens, the zonula adherens, and the macula adherens (or desmosome). Minor anatomical tracheobronchial variations may be found incidentally during bronchoscopy and/or CT scanning in 1-12 % of patients. However, these are rarely clinically relevant and usually remain asymptomatic. Variations may include different branching patterns and accessory lobar or segmental bronchi. Many airway diseases involve the bronchial tree in addition to lung parenchyma. Asthma is a heterogeneous disease, usually characterized by chronic airway inflammation that leads to variable expiratory airflow limitation (bronchoconstriction). It presents with respiratory symptoms such as wheeze, shortness of breath, chest tightness, and cough that vary over time. Disease severity varies. It has a complex pathophysiology. Airway hyperresponsiveness, eosinophilic inflammation, noneosinophilic inflammation, and airway remodeling that leads to chronic obstruction have all been implicated in its development. The mainstays of therapy are inhaled corticosteroids; inhaled bronchodilators are also used. Systemic steroids may be used for severe exacerbations. Emphysema refers to permanent dilatation of the most distal airways and damage of alveolar walls. Parenchymal architectural destruction leads to airway obstruction through the loss of the elastic properties of the lung. Alveolar damage and replacement with large air sacs (bullae) leads to an impaired capacity for gas exchange. Bronchoscopy is the process of direct visualization of the tracheobronchial tree. It may be performed with either a rigid bronchoscope or a flexible one. Flexible bronchoscopy is a minimally invasive procedure that can be performed with minimal preparation and sedation in an outpatient setting (see the video below). Conscious sedation is given before the procedure. Video of flexible bronchoscopy in 2-year-old child. Bronchoscope has dual channels: one channel contains fiberoptic fibers; other contains port for suctioning. Scope is passed through left nasal passage. As it is passed through nasopharynx, epiglottis and larynx come into view; as it goes through vocal fold, subglottis and trachea become visible. Scope is then passed down left mainstem bronchus to visualize left upper and lower lobe bronchi. Next, scope is pulled back and passed down right mainstem bronchus. Right upper, middle, and lower lobe bronchi are then visualized. Video courtesy of Ravindhra G Elluru, MD, PhD. Bronchoscopy enables visualization of the bronchial tree up to the level of the segmental bronchi and allows the clinician to obtain tissue and fluid samples from more distal airways and lung parenchyma by means of bronchoalveolar lavage, brushings, and transbronchial biopsies. Microbiologic and histopathologic analyses of these samples facilitate accurate diagnosis of various pulmonary diseases. Kim E. Barret. Introduction to Pulmonary Structure and Mechanics. Ganong's Review of Medical Physiology. 24. New York, NY: McGraw-Hill; 2012. Lawrence DA, Branson B, Oliva I, Rubinowitz A. The wonderful world of the windpipe: a review of central airway anatomy and pathology. Can Assoc Radiol J. 2015 Feb. 66 (1):30-43. [Medline]. John B. West. Respiratory Physiology: The Essentials. 9. Baltimore: Lippincott Williams & Wilkins; 2012. Wooten C, Patel S, Cassidy L, Watanabe K, Matusz P, Shane Tubbs R, et al. 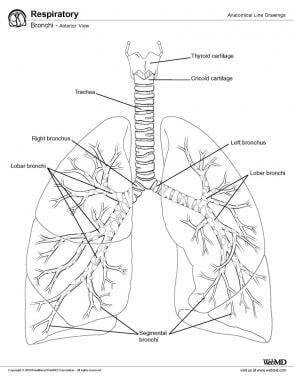 Variations of the tracheobronchial tree: anatomical and clinical significance. Clin Anat. 2014 Nov. 27 (8):1223-33. [Medline]. [Guideline] Global Initiative for Asthma. From the Global Strategy for Asthma Management and Prevention. 2015. Access Date 08/31/15. [Full Text]. Bel EH. Clinical Practice. Mild asthma. N Engl J Med. 2013 Aug 8. 369 (6):549-57. [Medline]. Rowe SM, Miller S, Sorscher EJ. Cystic fibrosis. N Engl J Med. 2005 May 12. 352 (19):1992-2001. [Medline]. Welsh EJ, Evans DJ, Fowler SJ, Spencer S. Interventions for bronchiectasis: an overview of Cochrane systematic reviews. Cochrane Database Syst Rev. 2015 Jul 14. 7:CD010337. [Medline].